You look in the mirror in the bathroom and you look the same. But there are scars across your chest. You are deformed. Nothing a nice baggy shirt couldn't hide, or a prosthesis. A prosthesis! When did that word enter my vocabulary? You can still wear your favorite date-night outfit, but you know and your husband knows—and maybe everybody knows—that under the alluring dress is a mangled car accident of a chest. I had always been taught the Bible instructs women to be modest. So there's one good thing breast cancer did to me—made me modest. It also made me humble. While I was going through chemo last year, I noticed a lot of young, healthy women with their hair dyed this grayish/lavender color. Interesting. As I tried to find a look for my suddenly bald head that would suit my personality (options including gypsy fortune teller scarf, baseball cap, coiffed Country Club lady curly wig, Raggedy Ann red yarn wig, hot pink wig, afro), I seemed to be drawn to the grayish/lavender wig the most. Maybe I desperately wanted to look cool instead of cancerous. After chemo, when my hair grew back in, it was gray! Who knew? I'd dyed it blonde my whole life. My friend Judy said, "It's not gray, it's lavender!" My husband nodded, quick to make me feel prettier. 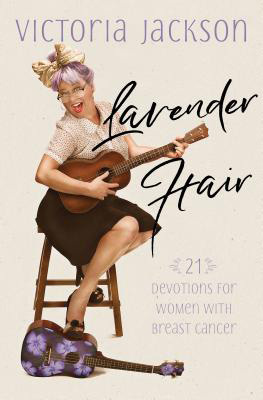 So I wrote a ukulele song called “Lavender Hair” and wrote a devotional called Lavender Hair, which I'm hoping will encourage and inspire other women and families who are going through cancer treatment. Amidst all the appointments, check ups, blood tests, and at home in my bed recovering, the one constant was my Bible. Since I learned to read at age six, I have studied the Bible. I even went to Florida Bible College for a year. The verse that kept popping into my head throughout my cancer year was Phillipians 1:21, "For to me, to live is Christ, to die is gain." It's a win/win if you know the Lord. God's Word is the truth I run to for comfort and Jesus is my hope for the future. He is my Healer, and one day I'll see Him face to face. **Excerpted from Victoria Jackson's Lavender Hair: 21 Uplifting Devotions for Women with Breast Cancer with permission.